Vingt Et Un is the French card game which is considered to be the predecessor of modern blackjack games and which was popular in the 17th century among all aristocrats, including such monarchs as Louis XV and Napoleon. Vingt Et Un definitely has much in common with blackjack game, though some differences are present of course; knowing all the aspects of this game, it is even possible to play it today together with friends for example. As well as blackjack, Vingt Et Un forced gamblers to get 21 points without busting and beat a dealer in such a way: two cards were dealt to a player and the combination of an Ace and any card of 10 points gave him/her a Natural; but it was not necessary to get a natural for winning because the main thing was to get scores more than a dealer got. 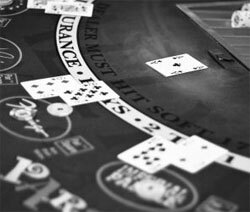 Here it is: the list of main aspects of Vingt Et Un to remember the blackjack origins and understand how it differed from the modern blackjack game. The second deal is Imaginary Tens - every player is supposed to have 10's and all scores are counted as 10 + the value of the second dealt card. The third deal is Blind Vingt Et Un - a player decides whether to take a third card or not without looking at his/her initial two cards. The fourth deal is Sympathy and Antipathy - a player chooses one of these two: if his/her two cards are of the same color - it is sympathy, if not - it is antipathy. The fifth deal is Rouge Et Noir - after a player has received 3 cards s/he bets on the majority of them will be red or black. The sixth deal is Self and Company - a player bets on the fact his two initial cards will be a pair. The seventh deal is Paying the Difference. The eighth deal is Clack.